We can't believe how fast these past months have gone by. It was just summer and now it's almost December! 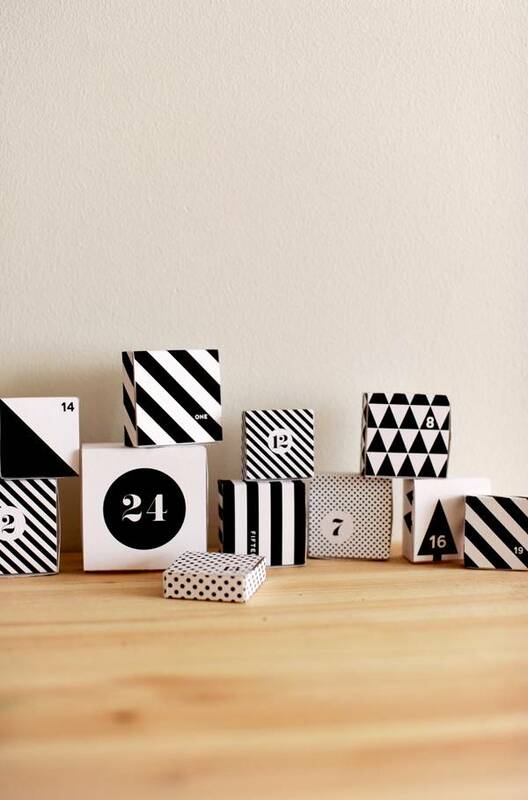 Time to start thinking about the holidays and definitely time to plan the christmas calendar. So, I thought while I whip up a calendar for my daughter, I might as well make it a free printable for you. These little boxes are perfect for filling them with treats, little notes and other small surprises. I've made the printables extra-budget friendly and ink-saving. You'll only need a printer, black ink, card stock, scissors and glue. Read below for instructions and find the printables in the end of this post. Joulu tulee taas tuotapikaa ja Michaela päätti tehdä tyttärelleen joulukalenterin, jonka jaamme myös teidän kanssa. Kalenteri on muste-ystävällinen ja erittäin edullinen ja helppotekoinen! Tarvitset vain mustaa mustetta, kartonkia, sakset ja liimaa. Alta löydät teko-ohjeet ja linkin kuvien tulostamiseen. 1 - print out the pdfs on card stock in a color of your choice. I've gone for a simple white, textured paper (280g/m2), because I still love black & white. Once you've printed out all templates, cut along the outer lines of each box. Then cut into the template along the fine lines as shown in picture 1. 2 - Fold the template over a ruler as shown in picture 2. Now those dotted lines are not actually printed onto the box templates, I've drawn them into the photo so you can see clearly where to fold the boxes. The ready folded template should look as shown in picture 3. 3 - Add paper glue or double sided tape onto the folded squares as shown in picture 3. 4 - Now fold the template into a box, glueing the side folds in one by one. 5 - And you're done! Fill your boxes with treats. 6 - Now you can either simply fold in the top or fix it with a little sticker. Especially if you want to mount your calendar and fill it with heavy treats, the sticker might be a good idea. 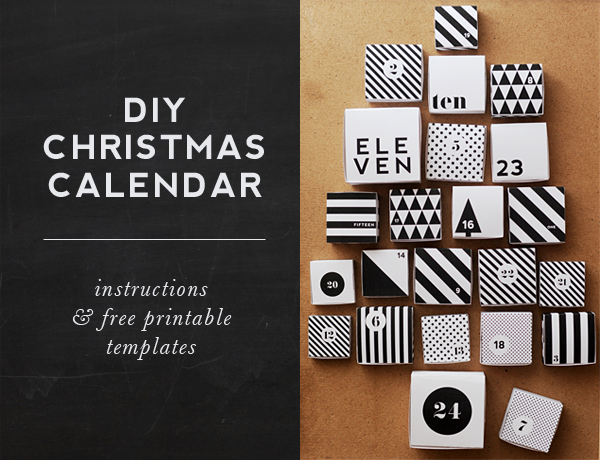 I will mount my calendar boxes in shape of a christmas onto a pin board or plywood. To do this, glue the backs of the boxes to a board of plywood or pin the open boxes onto a board with flat white pushpins. Like this, after the holidays, you can store it in the cellar or attick and re-use it next year! 1. Printtaa PDF-tiedosto haluammalesi värillisille kartongille (280gr kartonki on hyvä boxeille). Leikkaa ulkoreunojen mukaan laatikon muoto. Tämän jälkeen leikkaa ohuiden linjojen mukaisesti (Kuva 1). 2. Taita laatikon muoto viivottimen avulla. Huom. kuvan 2 viivat eivät ole printtaituna pohjiin, ne ovat vain havainnollistamassa taittoviivoja. Valmiiksi taitettu malli tulisi näyttää samalta kuin kuvassa 3. 3. Lisää paperiliimaa tai kaksipuoleistateippiä taittettuihin neliöihin, jotka näkyvät kuvassa 3. 4. Nyt taita pohja laatikon muotoon, liimaamalla sivut yksi kerrallaan. 5. Olet valmis! Täytä laatikot herkuilla. 6. Kannen voi joko taittaa tai teipata kiinni, teippaus on suositeltavaa eteenkin jos sinulla on raskaita karkkeja yllätyksenä. Asettele laatikot haluamaasi muotoon korkkiruuvitaululle tai puulevylle. Voit joko liimata laatikoiden takaosat puulevyyn tai kiinnittää nastoila korkkiruuvitauluun. Jos käytät nastoja, voit helposti varastoida kalenterin ja käyttää sitä uudelleen ensi vuonna! Download and print the calendar right here. This free printable is for personal use only. Please, do not re-distribute. But feel free to link to this post if you want to share this DIY on your blog or website! For more info on sharing, content and image copyright, please read our disclaimer here. Thank you! Im always thankful for printables! I love this! I think I'll print it and let the kids and a couple friends color the white spaces green and red, etc., then put them on a gold or silver poster board with a little saying or surpise inside each box. =) Thanks for sharing! This is so great..i love it. I just made us an advent calendar last year that is reusable so I'm going to tuck this gem tutorial away for another time! That's so cute! Thanks for sharing! I am in black and white heaven thankyou thankyou I absolutely love it. Please keep doing what you're doing. You & your blog are very inspirational! I really love your printable calendar! I would write about the calendar at my blog and link to your site.. if it's ok? Thank you very much for this cool idea and print out. I absolutely love this! Thank you so much!! Hi! I had to try it. Thanks a lot!!! 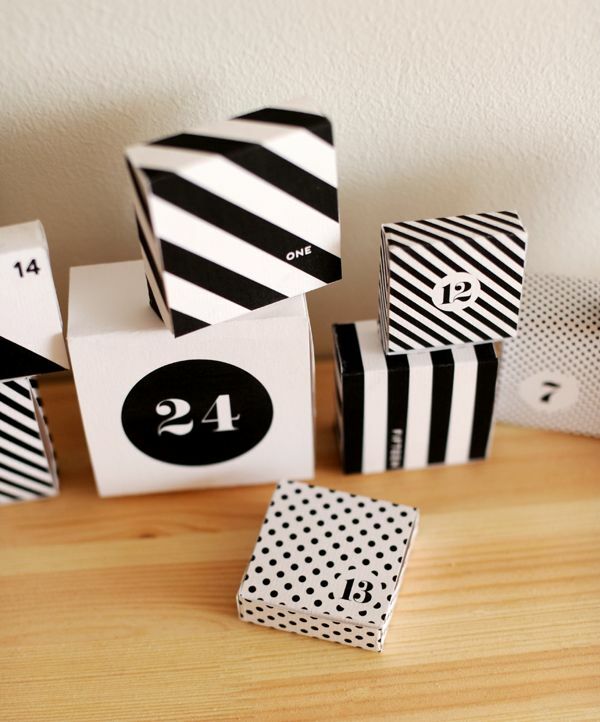 I posted a link to my, I have to admit, not so perfect version at: http://www.solebich.de/diy-adventskalender-von-heylook/270625. I hope this is fine for you. Thank you for solving my Advent Calendar -crisis! Thank you for this template. I finished my calendar last night and can't wait for tomorrow when my son can open the first box. Hello, and well done for this amazing work. I passed by this work on Behance, maybe you should check this work inspired by your project. Just finished mine. Thanks for this easy, last-minute, project! Aivan ihana kalenteri! Monta hetkeä olen surffaillut sopivaa kalenteria etsimässä ja nyt se löytyi:) Kertoisitko, minkä kokoinen taulu sulla on pohjana? great idea. what size is the pin board? I absolutely love this calendar! So cute! Un grand merci pour ce tuto ! L'impression est impeccable... résultat bientôt ! laurie, you may not see the cut lines in the pdf on screen depending on what software or browser you're viewing this on. when you print it out, they will be visible for sure though! Thank You SO much for these printables. 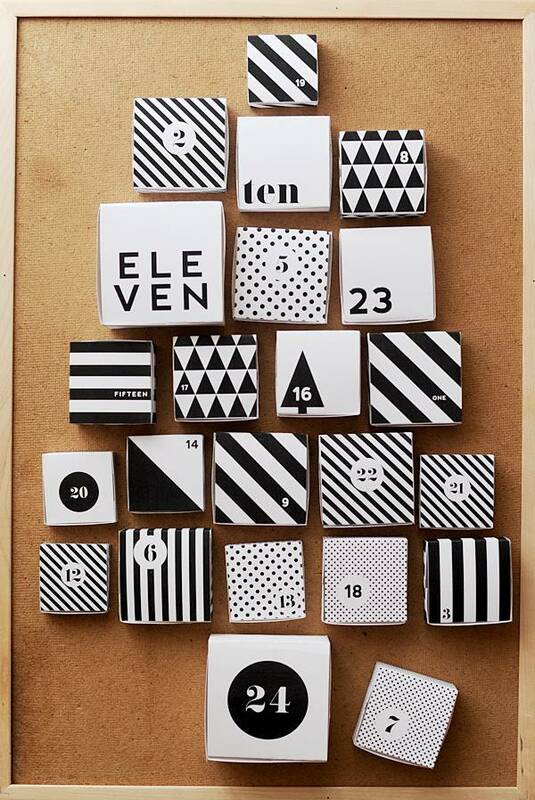 I have been searching for this exact type boxes for my advent calendar so that I can use different colored card stocks. It is wonderful that you make them for all to enjoy and use. I appreciate your creative mind generous spirit. i like your blog, and this a very good blog. Looking forward to reading more. Great article. Really thank you! It is a unique and appreciable gift for our loved ones specially children. Its looks like a cool and valuable idea and a perfect version to make anyone happy. Black and white combination gives awesome look. I just love the way of creation and details about the box. 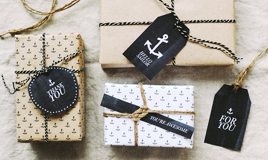 These are a perfect match to give surprise and create fun. Contents are such that I think nobody can stop himself from reading. So I just love the article. I love it! it`s so amazing! thank you sooo much! other people would sell it for quite a lot of money and you offer something this beautiful for free! that`s real christmas spirit!!! شقق للبيع Really appreciate you sharing this blog post. Really thank you! Really Cool. كتاب سيو Thank you ever so for you blog article. Thanks Again. Really Great. برامج سيو Really appreciate you sharing this blog post.Thanks Again. Fantastic. Wow Amazing Calender is this. Read More About Christmas Loans.